Livingston Hopkins was born at Bellefontaine, Ohio, USA. He studied drawing briefly under the German artist, August Will (1834-1910) in New York, where he successfully established himself as a cartoonist, engraver and illustrator using the nom de plume 'Hop' in a variety of journals, newspapers and books, including his own 'The comic history of the United States by Livingston Hopkins with seventy-five illustrations from sketches taken at a safe distance by the author' (1876). He took up an appointment as staff artist on the 'Bulletin', Sydney in 1883 at the request of W H Traill, its Managing Director. Hopkins had learnt to etch before he came to Australia and owned an etching press. He knew the etchings of the influential French artist Maxime Lalanne and his book on etching 'Traité de l'gravure à l'eau-forte' (Paris, 1866) published in English in New York as 'A treatise on etching' in 1880. 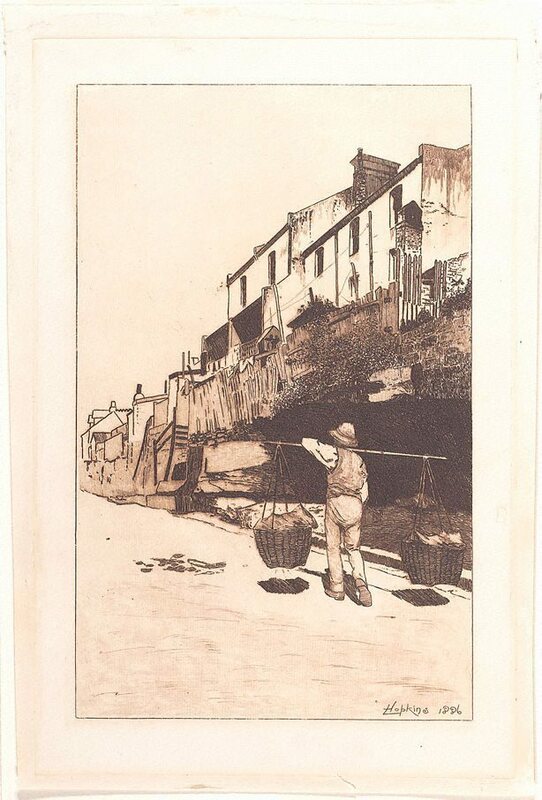 Hopkins introduced a number of artists in Sydney to etching including Julian Ashton, Tom Roberts, Arthur Streeton and B E Minns, making his press available to them. Hopkins' interest in Sydney streets, especially around The Rocks, influenced Julian Ashton, Lionel Lindsay and Sydney Ure Smith in their choice of subjects, as did his unfussy, linear approach to etching and printing. A study for this etching in pen and ink of almost the same size is also in the Gallery's collection. The etching is not in reverse to the drawing inferring that it was etched in reverse on the plate, a skill in which Hopkins was well practised as an illustrator whose drawings were translated into wood engravings. Differences between the drawing and etching are few. The drawing has the title hand-lettered beneath the borderlines. Signed and dated within plate to print l.r., brown ink "LHopkins 1886".